This name uses Spanish naming customs: the first or paternal family name is Sala and the second or maternal family name is Taffarel. 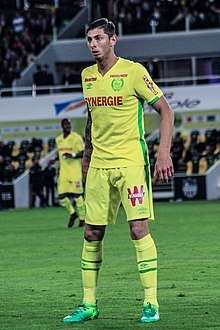 Emiliano Raúl Sala Taffarel (Spanish pronunciation: [emiˈljano ˈsala]; 31 October 1990 – 21 January 2019) was an Argentine professional footballer who played as a forward. After playing youth football in Argentina and following a short spell in Portugal's regional leagues, Sala began his professional career in France with Bordeaux, making his professional debut in February 2012. After struggling to break into the first team, he was loaned out to Championnat National side Orléans and Ligue 2 side Niort in consecutive seasons. He enjoyed prolific spells with both clubs, scoring 39 goals between them, before returning to Bordeaux. After initially being promised an increased role after his successful loans, Sala fell out of favour again, and instead, joined fellow Ligue 1 side Caen on loan. In 2015, he signed for Nantes on a permanent basis. With Nantes, he made more than 100 appearances in Ligue 1, and achieved a successful goalscoring record, finishing as the club's top goalscorer for three consecutive seasons. His form prompted a move to Cardiff City in January 2019, for a club record fee of £15 million (€18 million). Sala died in a plane crash off Alderney on 21 January 2019. He was flying from Nantes to Cardiff aboard a Piper Malibu light aircraft. An initial three-day search covered 1,700 square miles (4,400 km2) across the English Channel. Two subsequent private searches were launched, resulting in the discovery of the wreckage on 3 February; Sala's body was recovered four days later. Sala was born in the town of Cululú, Santa Fe Province, Argentina, to Horacio Sala and Mercedes Taffarel. His father worked as a truck driver; the family later moved to Progreso. He held an Italian passport. He had a brother, Dario, and a sister, Romina. He was a fan of Independiente and, while growing up, he studied footage of his favourite footballer, Gabriel Batistuta. Sala began playing football for San Martín de Progreso, where he remained until he was 15 years old. He then moved to San Francisco, Córdoba to play at football school Proyecto Crecer after being spotted by a scout. The club was directly affiliated with Spanish club RCD Mallorca and French side FC Girondins de Bordeaux, scouting local players in the area. After joining the club, he moved into a boarding house with other players from the club's youth system. He played six Preferente matches for Spanish club CD Soledad B between October 2007 and February 2008. In 2009, while living in Granada, Spain, he was recommended to Portuguese District side FC Crato by a fellow Argentinian footballer who played there and joined the Portuguese team. Sala played one official match for Crato, scoring twice, but suddenly decided to leave the club and return to Argentina, saying that his girlfriend was "in trouble" in his homeland. At the age of 20, during the 2010–11 season, Sala moved to Europe to sign for Bordeaux, the French partner club from Proyecto Crecer. After arriving in France, Sala briefly lived with the club's youth coach Marcelo Vada and his son, Sala's teammate, Valentín Vada, who were from the same region of Argentina. Having progressed through the club's reserve team, Sala grew frustrated with his lack of first-team playing time, and his agent offered him to several Italian clubs, including Sorrento, but this was rejected in each case. On 8 February 2012, Sala made his Bordeaux senior competitive debut in the 2011–12 Coupe de France round of 16 3–1 away defeat against Olympique Lyonnais, coming on as a substitute in the 105th minute for Jussiê. Unable to establish himself in the first team, Bordeaux hoped to loan Sala out in order to gain experience and he was expected to sign for a team in Spain before his agent rejected the move, wanting Sala to remain in France. He instead joined Championnat National side US Orléans on loan after being spotted by manager Oliver Frapolli a year previously. Frapolli described Sala as "the best player on the team, without question", as he went on to score nineteen goals for the club in 37 appearances. He helped the club to an eighth-place finish in the Championnat National. On 2 July 2013, Sala agreed a deal to join Ligue 2 club Chamois Niortais on loan for the entire 2013–14 season. He enjoyed a steady return through the first half of the season before finding form in March, scoring eleven goals in his final twelve appearances including scoring his first career hat-trick in a 4–2 victory over Stade Lavallois. He finished the season with 20 goals in all competitions, with his total of 18 league goals setting a new club record for goals in a single season. At the start of the 2014–15 season, Sala was brought into the first team squad with Bordeaux by manager Willy Sagnol and was rewarded with a two-year extension to his contract. He scored his first senior goal for the club after converting a penalty during a 4–1 defeat to Monaco. However, it proved to be his only goal in eleven appearances, and he was loaned to SM Caen, another Ligue 1 club, for the second half of the 2014–15 season as a replacement for Mathieu Duhamel. Caen had previously tried to sign Sala at the start of the season but had been rejected by Bordeaux. He made his debut for Caen on 1 February 2015 in a 1–0 victory over Saint-Étienne. He scored his first goal for the club in his third appearance, during a 2–2 draw with Paris Saint-Germain two weeks later, and scored a brace against RC Lens in his following match. He scored five goals for Caen during his loan spell before returning to Bordeaux. On 20 July 2015, Sala joined Ligue 1 club Nantes on a five-year contract with Nantes paying a reported transfer fee of €1 million to Bordeaux. He made his debut for Nantes on the opening day of the 2015–16 season, during a 1–0 victory over Guingamp, and scored his first goal for the club on 5 December 2015 in a 1–1 draw with Ajaccio. In January 2016, Nantes rejected a bid of £3 million from Wolverhampton Wanderers for Sala. In his first season, despite scoring only six times, he finished the year as the club's top goalscorer. During his second season, Sala scored twelve league goals for Nantes, the highest scoring player in a single season for the club since Olivier Monterrubio in 2000–01. He equaled his tally again in the 2017–18 season, finishing as Nantes' top scorer for the third consecutive season since his arrival at the club. At the start of the 2018–19 season, Sala fell out of favour under new manager Miguel Cardoso who preferred Kalifa Coulibaly as the club's first choice striker. Turkish side Galatasaray made a late bid to sign Sala on the last day of the summer transfer window but the move later collapsed. Sala twice made goalscoring appearances as a substitute and was restored to the starting line up under Cardoso before the manager was sacked in October 2018. Vahid Halilhodžić was appointed as the club's new manager and in his first match in charge, on 20 October 2018, Sala scored a hat-trick in a 4–0 Ligue 1 home win over Toulouse. He thus became the first FC Nantes player to score three goals in a Ligue 1 match since Mamadou Diallo did so against FC Sochaux-Montbéliard in February 2006. At the end of October, he was voted Ligue 1 Player of the Month having scored four goals in three matches during the month. Sala's good form saw him as the joint-highest goalscorer in Ligue 1 at the start of December, his tally of twelve goals tied with Paris Saint-Germain's Kylian Mbappé. On 5 December, Sala scored his last goal for the club in a 3–2 Ligue 1 home victory over Olympique de Marseille. On 16 January 2019, he played his final match for the club in a 1–0 Ligue 1 away defeat against Nîmes Olympique. On 19 January 2019, Sala joined Premier League side Cardiff City on a three and a half-year deal for a club record transfer fee, reported to be £15 million. The transfer beat the previous club record of £11 million paid for Gary Medel in 2013. As part of a sell-on clause, 50% of the transfer fee was due to his first professional club Bordeaux. Sala rejected a late bid from a club in the Chinese Super League to join Cardiff, despite being offered a higher transfer fee and salary, due to his desire to play in the Premier League. Following Sala's death, Nantes demanded the transfer fee from Cardiff. Hello, my brothers, how are you? Boy, I’m tired. I was here in Nantes taking care of things, things, things, things, things, things, and it never stops, it never stops, it never stops. Anyway guys, I’m up in this plane that feels like it's falling to pieces, and I’m going to Cardiff. [It's] crazy, we start tomorrow. Training in the afternoon, guys, in my new team... Let's see what happens. So, how's it going with you guys, all good? If in an hour and a half you have no news from me, I don't know if they are going to send someone to look for me because they cannot find me, but you will know... Man, I'm scared! Guernsey Police initially searched for three days over 1,700 square miles (4,400 km2) across the English Channel. At 15:15 GMT on 24 January 2019, after a "very thorough and extensive search" including eighty hours of combined searching undertaken by three planes, five helicopters and two lifeboats, the police announced that they had called off the search for the aircraft or any survivors. The decision led to calls worldwide for the search to continue, including numerous other footballers, among them fellow Argentine players Lionel Messi, Gonzalo Higuaín, Sergio Agüero and former player Diego Maradona. The president of Argentina, Mauricio Macri, stated his intention to request the British and French governments to resume the search. An online petition also attracted over 65,000 signatures and Sala's family later announced their decision to fund a private search. Over £280,000 was raised for this search on GoFundMe started by Sports Cover, a sports agency that represented Sala. The funds enabled the private search to commence on 26 January, with the launch of two boats, led by marine scientist David Mearns. On 28 January, plans were announced for an underwater search to begin "within a week", dependent on weather conditions, using an unmanned remotely operated underwater vehicle (ROV) to search an area of seabed north of Hurd's Deep. On 29 January, Cardiff City included Sala on the team sheet for their game against Arsenal, with a daffodil next to his name in place of a squad number. On 30 January, the Air Accidents Investigation Branch (AAIB) reported that they had found two seat cushions washed up on a French beach, which were believed to be from the missing aircraft. On 3 February, another underwater search for the aircraft began, using the AAIB's Geo Ocean III vessel and a privately funded vessel, which were conducting sonar surveys of the seabed. The planned search, lasting three days, would cover an area of 4 square nautical miles (14 km2; 5.3 sq mi), about 24 nautical miles (44 km; 28 mi) north of Guernsey. At approximately 21:11 GMT, six hours after the new search began, wreckage from the aircraft was found at a depth of 63 metres (207 ft). On 4 February, investigators stated that there was one body visible inside the wreckage. On 7 February, the body was recovered from the wreckage and taken to the Isle of Portland to be passed to the Dorset coroner. Later that day, Dorset Police identified the body as Sala's by means of fingerprint evidence. Nantes subsequently retired his former number 9 jersey. On 11 February the results of a post mortem reported that Sala had died of "head and trunk injuries". Sala's funeral was held in his hometown of Progreso on 16 February 2019. On 25 February 2019, a Special Bulletin was issued by the AAIB. On 28 February ex-football agent Willie McKay, who had arranged the flight, said that Sala had been "abandoned" by Cardiff City and was left to arrange his own travel. McKay's son Mark was Nantes' acting agent in the deal for Sala. The football club said they "strongly reject" the claim they neglected to provide Sala with travel arrangements. Sala stated that he modelled his style on his idol, former Argentine international forward Gabriel Batistuta. BBC Sport compared Sala to Jamie Vardy, describing him as "a player who likes wide spaces and being part of a team that has a strong counter-attacking style." A large and powerful striker, he was also recognised for his ability to hold the ball up and was described as possessing "reasonable" pace; he also drew praise in the media for his work-rate, tenacity, eye for goal, and finishing ability. ^ a b c d e f "E. Sala". Soccerway. Retrieved 4 January 2019. ^ a b c ""It's hopeless, you can't believe": Emiliano Sala father after the disappearance of the flight". vaaju.com. 22 January 2019. Retrieved 22 January 2019. ^ "Emiliano Sala feared dead: desperate hunt for missing plane with Cardiff City's new £15m striker on board called off for the night". London Evening Standard. 22 January 2019. Retrieved 22 January 2019. ^ a b c Bories, Flavien (5 March 2017). "Emiliano Sala: Quand je Veux Quelque Chose je Me Bats". sofoot.com (in French). Retrieved 22 January 2019. ^ Furlone, Aquiles (22 January 2019). "Darío, hermano de Sala: "Lo único que ha hecho toda su vida es estar con la pelota" (in Spanish). Mundo Deportivo. Retrieved 23 January 2019. ^ a b "Todo el pueblo francés está en shock" (in Spanish). Olé. 27 November 2015. Retrieved 26 January 2019. ^ a b Bougis, Axel (14 February 2014). "Sala: J'ai Beaucoup Regarde Batistuta". sofoot.com (in French). Retrieved 22 January 2019. ^ a b c "Joven futbolista de Progreso tiene su destino en España" (in Spanish). El Santafesino. 9 September 2007. Archived from the original on 17 June 2008. Retrieved 22 January 2019. ^ a b "Emiliano Sala jugará en la Premier League de Inglaterra" (in Spanish). Diaxdia. 21 January 2019. Retrieved 22 January 2019. ^ "Partidos - 2007-2008 - EMILIANO R SALA" (in Spanish). Punto Balon Balear. Retrieved 9 February 2019. ^ "Partidos - 2007-2008 - EMILIANO RAUL SALA" (in Spanish). Punto Balon Balear. Retrieved 9 February 2019. ^ "Jogador argentino desaparecido em avião começou a carreira no Crato" (in Portuguese). Record. 22 January 2019. Retrieved 23 January 2019. ^ "Quem é Emiliano Sala, contratação mais cara do Cardiff que está desaparecida em voo?" (in Portuguese). Globoesporte. 22 January 2019. Retrieved 23 January 2019. ^ a b c Baron, Jeramie (4 March 2018). "Comment Emiliano Sala (Nantes) s'est fait un nom dans les divisions inférieures avant de briller en Ligue 1" (in French). France Football. Retrieved 22 January 2019. ^ a b Moore, Steven (21 November 2018). "Emiliano Sala: From Serie C Reject to Ligue 1 Top Scorer". Breaking the Lines. Retrieved 22 January 2019. ^ a b c White, Adam (22 January 2019). "Emiliano Sala, the humble forward who enriched everyone's lives". The Guardian. Retrieved 22 January 2019. ^ "Lyon vs. Bordeaux - Football Match Summary - February 8, 2012 - ESPN". ESPN.com. Retrieved 3 February 2019. ^ "Emiliano Sala". FootballDatabase.eu. Retrieved 2 July 2013. ^ a b Rostac, Matthieu (27 February 2015). "Emiliano Sala: Pret du But". sofoot.com (in French). Retrieved 22 January 2019. ^ Chochois, Alexandre (2 July 2013). "Niort: Un buteur de Bordeaux débarque en prêt (off.)" [Niort: Bordeaux striker arrives on loan (official)] (in French). foot-national.com. Retrieved 2 July 2013. ^ "BORDEAUX : SALA PROLONGE DE DEUX ANS". mercato365.com. 3 July 2014. Retrieved 27 January 2019. ^ a b "Emiliano Sala, Un Atout Supplementaire Pour Le Maintien" (in French). SM Caen. 28 January 2015. Retrieved 22 January 2019. ^ "Emiliano Sala, un atout supplémentaire pour le maintien" (in French). smcaen.fr. 28 January 2015. Retrieved 29 January 2015. ^ "Nantes make Sala a canary". Yahoo Sports. 20 July 2015. Retrieved 15 May 2017. ^ a b c White, Adam; Devin, Eric (5 November 2018). "The most prolific Argentinian striker in Europe this season? Emiliano Sala". The Guardian. Retrieved 22 January 2019. ^ Aarons, Ed (22 January 2016). "Nantes reject £3m bid from Wolves for forward Emiliano Sala". The Guardian. Retrieved 23 January 2019. ^ Dupont, Régis (20 October 2017). "Emiliano Sala cut for the fight". L'Equipe (in French). Retrieved 27 January 2019. ^ a b Yew, Oliver (25 January 2019). "In Profile: Emiliano Sala". Sky Sports. Retrieved 27 January 2019. ^ "Sala hits three as Nantes crush Toulouse". www.ligue1.com. 20 October 2018. ^ "Ligue 1: Emiliano Sala voted best player of the month of October". L'Equipe (in French). 12 November 2018. Retrieved 27 January 2019. ^ "Emiliano Sala revient sur Kylian Mbappé : le classement dynamique des buteurs de Ligue 1 après la 16e journée". L'Equipe (in French). 5 December 2018. Retrieved 27 January 2019. ^ "Emiliano Sala: Cardiff City sign Nantes striker for undisclosed club-record fee". BBC Sport. 19 January 2019. Retrieved 22 January 2019. ^ Abbandonato, Paul (19 January 2019). "Cardiff City announce signing of goal ace Emiliano Sala in club record £15m deal". WalesOnline. Media Wales. Retrieved 19 January 2019. ^ "Disparitiom D'Emiliano Sala : Bordeaux Dement Avoir Reclame De L'Argent À Nantes". football365.fr (in French). 27 January 2019. Retrieved 27 January 2019. ^ Abbandonato, Paul (19 January 2019). "Cardiff City £15m 'capture' Emiliano Sala rejects huge 11th hour Chinese offer – French reports". WalesOnline. Media Wales. Retrieved 22 January 2019. ^ "Emiliano Sala: Nantes demand transfer fee from Cardiff City". 6 February 2019 – via www.bbc.co.uk. ^ a b Booth, Dominic (24 January 2019). "Who is football agent Mark McKay, his relationship with Emiliano Sala, Cardiff City and his academy twin brothers?". WalesOnline. Media Wales. Retrieved 25 January 2019. ^ James, Stuart (23 January 2019). "'Subdued' Cardiff City players train as Emiliano Sala dominates thoughts". The Guardian. Retrieved 25 January 2019. ^ a b Morris, Steven (28 January 2019). "Emiliano Sala's family hire submarine to hunt for missing plane". The Guardian. Retrieved 29 January 2019. ^ "Emiliano Sala: Search for Cardiff City FC player's plane suspended". BBC News. Retrieved 22 January 2019. ^ a b Lewis, Anna (26 January 2019). "Inside the search for Emiliano Sala: What happened during three grueling days that ended in vain". WalesOnline. Media Wales. Retrieved 26 January 2019. ^ "Rescuer has 'no hope' for missing player". BBC News. 23 January 2019. Retrieved 23 January 2019. ^ "Emiliano Sala's audio message from plane". Sky Sports. Retrieved 23 January 2019. Translation is from the Sky Sports article. ^ Parveen, Nazia; Morris, Steven (25 January 2019). "Emiliano Sala pilot's friends 'surprised' he took night flight" – via www.theguardian.com. ^ "Emiliano Sala: Search for footballer and pilot called off". BBC News. 24 January 2019. ^ "Emiliano Sala: search for footballer and pilot called off". The Guardian. 24 January 2019. ISSN 0261-3077. Retrieved 24 January 2019. ^ "Emiliano Sala: Lionel Messi leads calls from across football for search to resume". BBC Sport. 25 January 2019. Retrieved 26 January 2019. ^ "Messi and Maradona plead for Sala search to continue". Belfast Telegraph. 25 January 2019. Retrieved 27 January 2019. ^ a b "Emiliano Sala: Argentina president backs new search for footballer". BBC News. 25 January 2019. Retrieved 26 January 2019. ^ Farrell-Roig, Estel (25 January 2019). "Emiliano Sala's family to organise for private search boats and divers to find missing Cardiff City footballer". WalesOnline. Media Wales. Retrieved 26 January 2019. ^ a b "Emiliano Sala search: Footballer's family thanks donors". BBC News. 27 January 2019. Retrieved 27 January 2019. ^ Doel, Jon; Sands, Katie (26 January 2019). "Live updates as new Emiliano Sala search launched following remarkable fundraising campaign". WalesOnline. Media Wales. Retrieved 27 January 2019. ^ McGeehan, Matt (29 January 2019). "Arsenal remember Emiliano Sala with touching programme tribute to missing Cardiff striker". Evening Standard. Retrieved 29 January 2019. ^ Sands, Katie; Walford, Jessica (30 January 2019). "Parts of missing plane carrying Emiliano Sala and pilot found on beach". WalesOnline. Media Wales. Retrieved 30 January 2019. ^ "Emiliano Sala: Missing Premier League footballer's plane found". Sky News. Retrieved 3 February 2019. ^ "Sala plane wreckage found in Channel". 3 February 2019. Retrieved 3 February 2019. ^ "'One occupant visible' in Emiliano Sala plane wreckage - investigators". Sky News. Retrieved 5 February 2019. ^ "Emiliano Sala crash: fuselage of plane with one body on still on board pictured on seabed". MSN. Retrieved 5 February 2019. ^ "Body recovered from plane which crashed into English Channel confirmed as footballer Emiliano Sala". ITV News. 7 February 2019. Retrieved 7 February 2019. ^ a b Doel, Jon; Booth, Dominic (11 February 2019). "Live updates as inquest into Emiliano Sala's death adjourned". WalesOnline. Media Wales. Retrieved 11 February 2019. ^ Burton, Chris (8 February 2019). "Nantes to retire No.9 shirt in honour of Emiliano Sala as they pay emotional tribute to their former striker". Goal.com. ^ "Emiliano Sala's funeral held in Argentina". CNN. 16 February 2019. Retrieved 17 February 2019. ^ "AAIB Bulletin S1/2019 SPECIAL" (PDF). assets.publishing.service.gov.uk. 25 February 2019. Retrieved 25 February 2019. ^ Roan, Dan (1 January 1970). "Emiliano Sala plane crash: Footballer was 'let down' by Cardiff, says Willie McKay - BBC Sport". Bbc.co.uk. Retrieved 1 March 2019. ^ Bielderman, Erik (22 January 2019). "Emiliano Sala: Profile of 'a South American warrior' & the 'local Carlos Tevez". BBC Sport. Retrieved 22 January 2019. ^ a b Yew, Oli (23 January 2019). "In profile: How hard work helped Emiliano Sala become Nantes hero and earn Premier League transfer". Sky Sports. Retrieved 23 January 2019. ^ Morgan, Tom (22 January 2019). "Emiliano Sala: Who is Cardiff's £15m record signing?". The Daily Telegraph. Retrieved 22 January 2019. Wikimedia Commons has media related to Emiliano Sala.